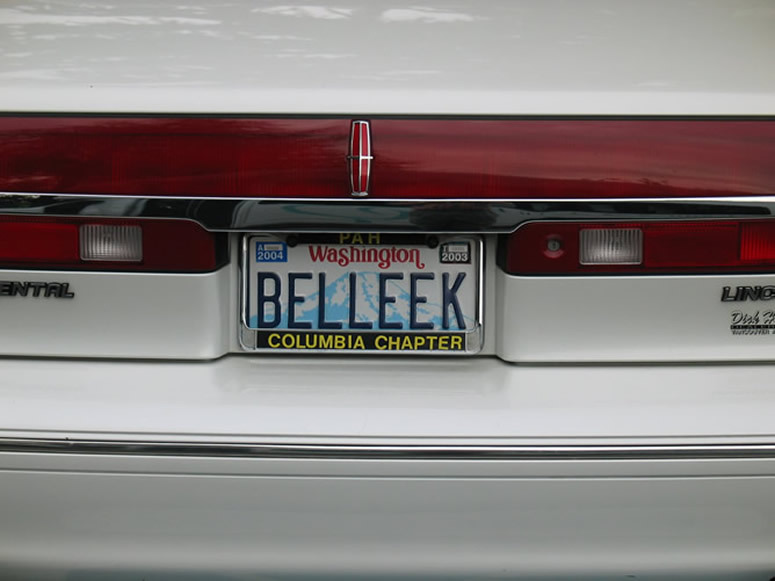 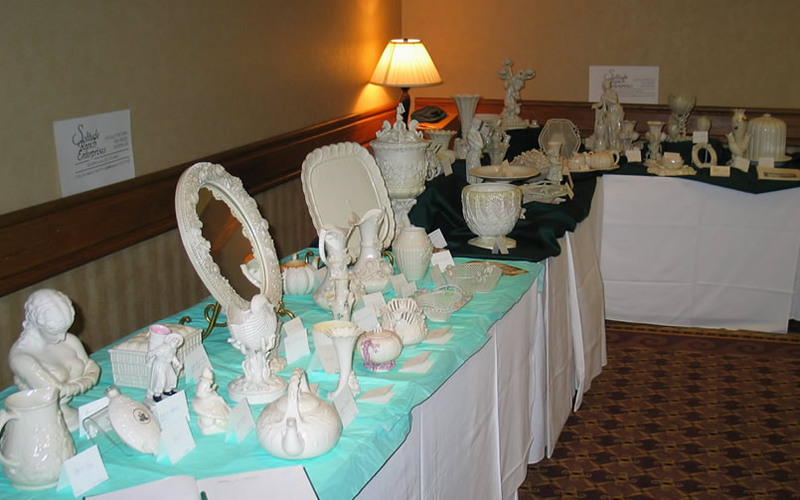 Since 1993, the International Belleek Collectors Society has hosted a bi-annual convention. 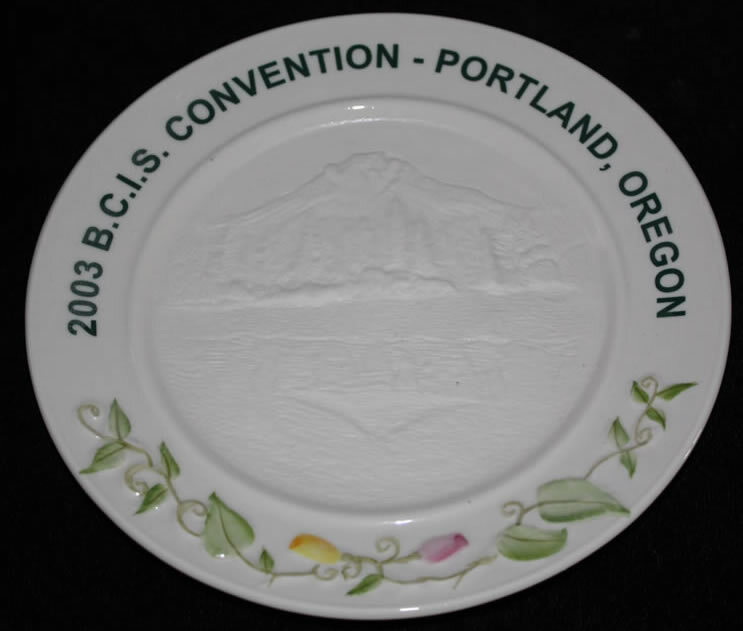 The venue for our 2003 event was the Doubletree Inn at Portland Oregon. 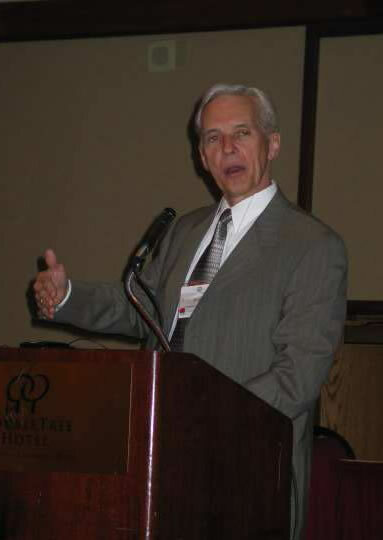 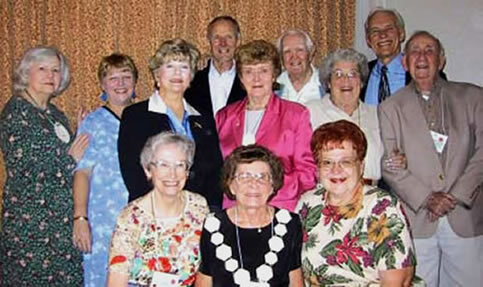 The 2003 convention, was hosted by the Columbia Chapter .The Convention Commitee consisted of Pat Holm, Rose Ann Ranft and Rick Bolme who along with all the chapter members were perfect hosts. 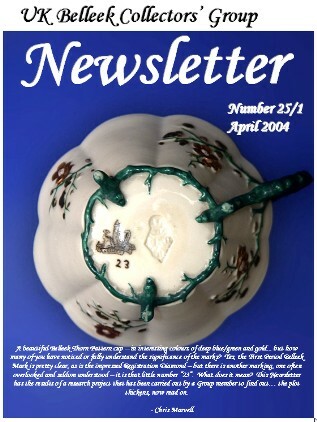 Our UK Belleek Newsletter issue 25.1 has a full and detailed account of this wonderful convention. 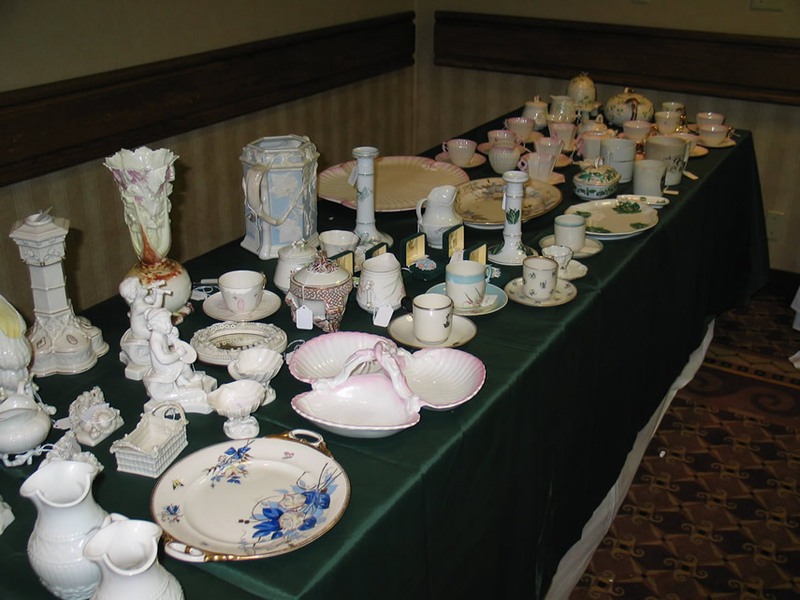 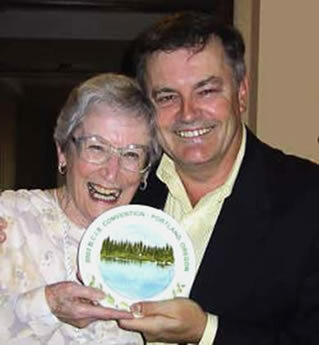 As a taster, events included a breakfast cruise on the Columbia and Williamette rivers, Dorothy Wheeler's ( San Diego Chapter) induction into the Belleek Hall of Fame, A talk on displaying your Belleek by Rhonda and Jerome Hanson. 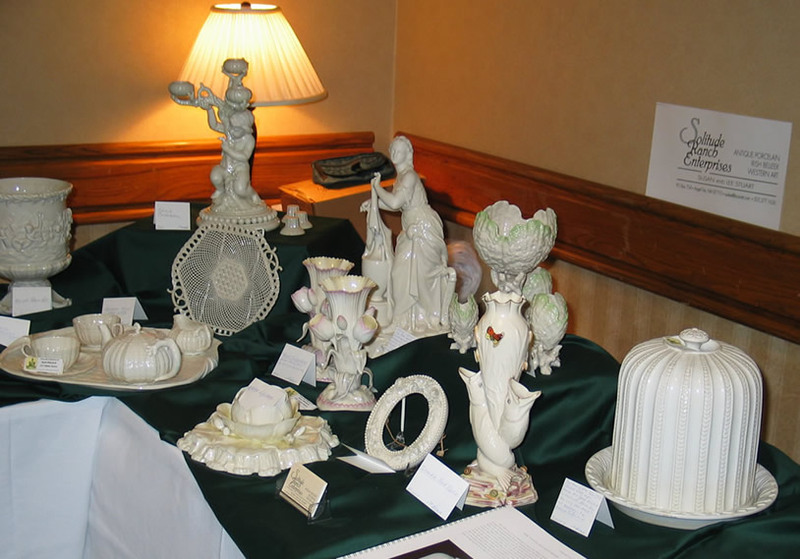 Don Cambell's presentation on Belleek Earthenware. 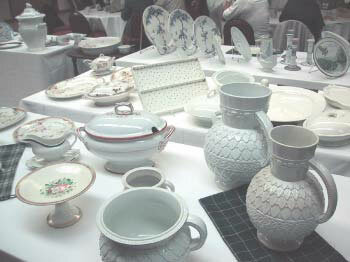 Olga Clarge and Marion, Lady Langham presented a slide show of Rare and Unrecorded Belleek. 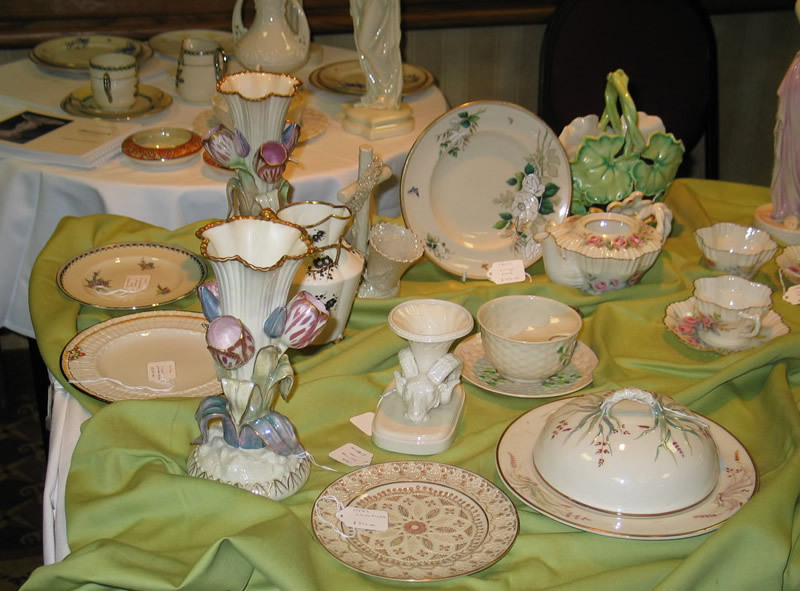 George Moore, Pottery Owner, brought us up to speed with events at Belleek and as tradition dictates towards the end of the convention programme the convention plate mould was broken. 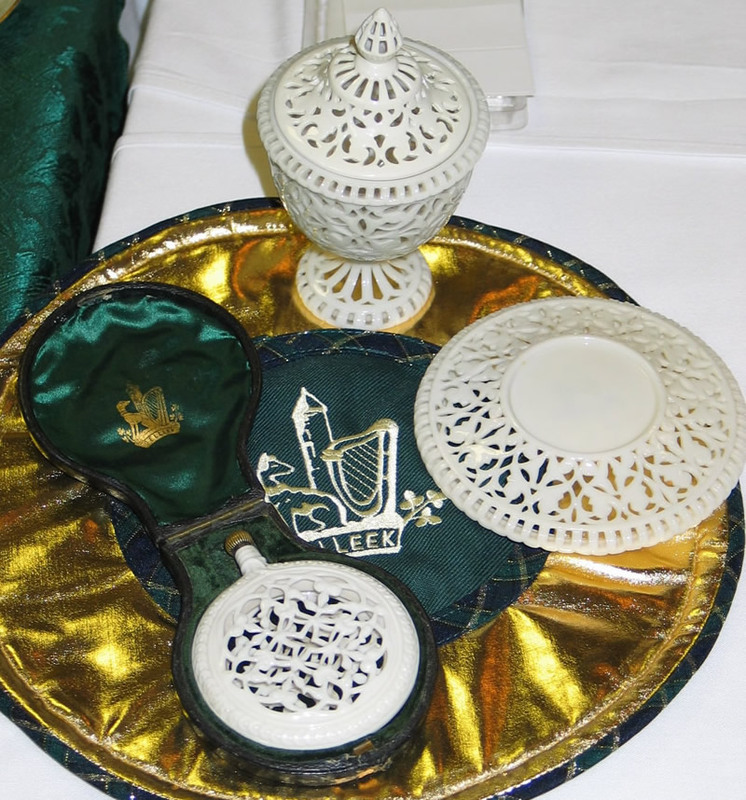 On the final evening a Gala Banquet was held. 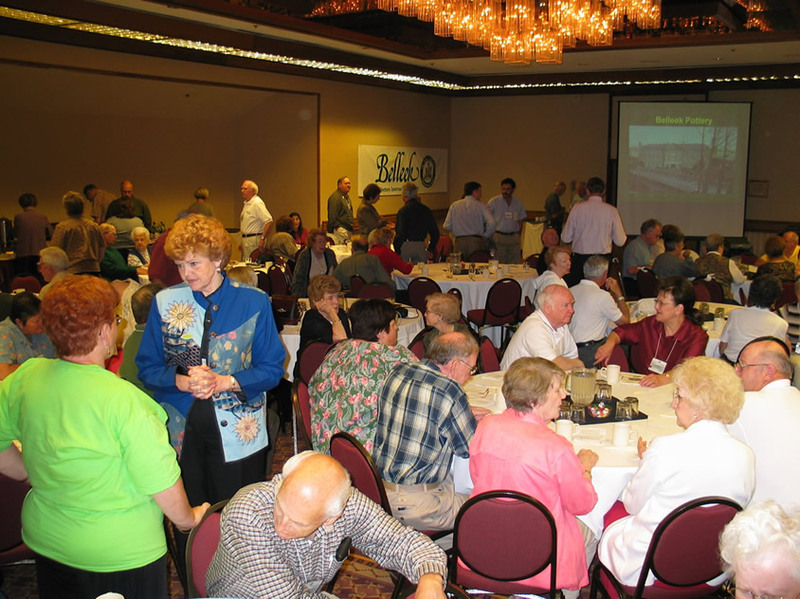 above.. UK Group attendees...After dinner by the Willamette River Paul Pat and Patrick Tubb left, Christine and David Reynolds Right.. 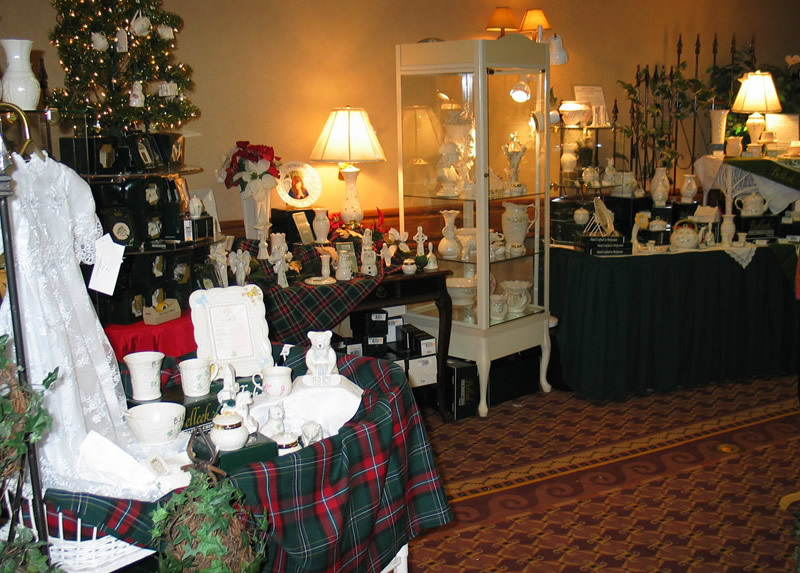 Above... general view of display. 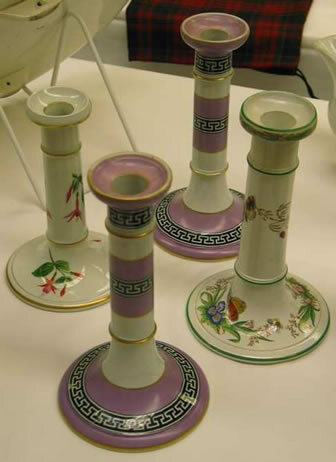 Right... some candlesticks each disctinctly decorated. 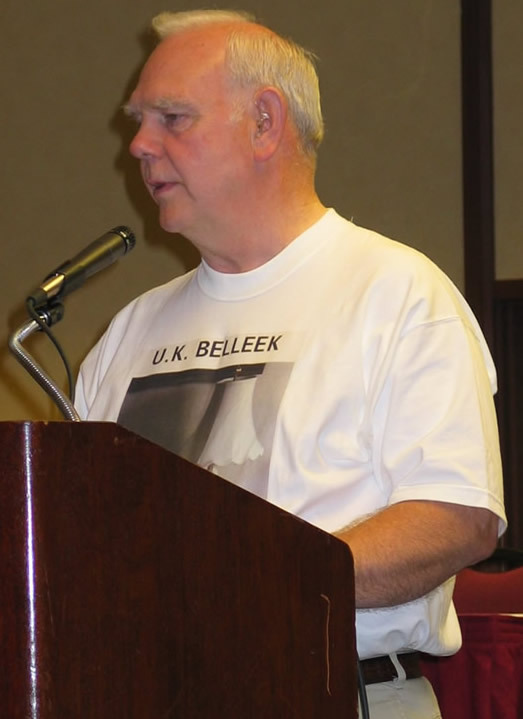 Below left, Don Campbell presentation on Belleek Earthenware and right, Jerry Hanson sporting a UK Group Tee-Shirt!! 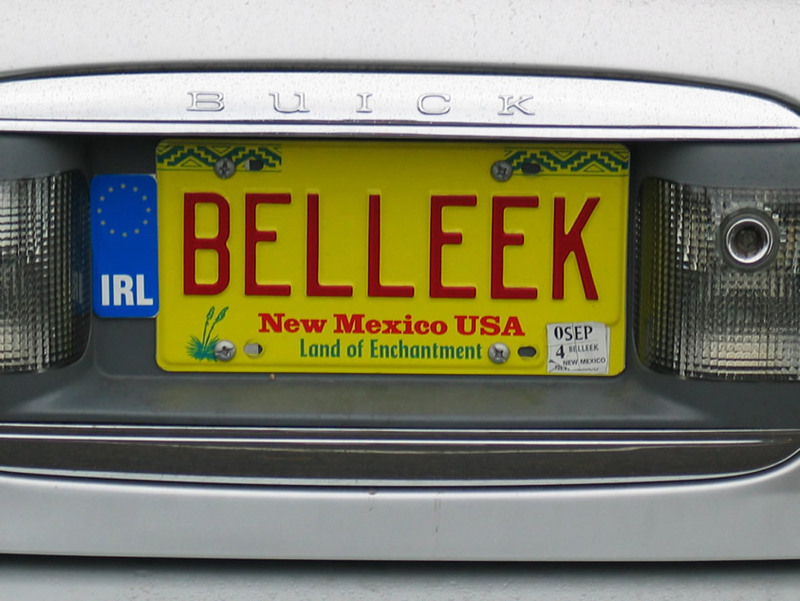 In the Hotel Car Park...ultimate personalised number plate on this Lincoln Continental and below on New Mexico reg'd Buick. 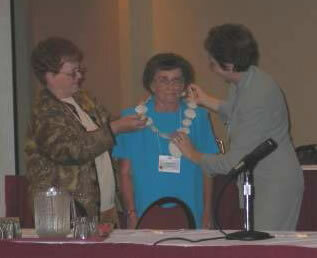 Above...Phyllis Bagnall unveiled her portrait to the Convention Audience. 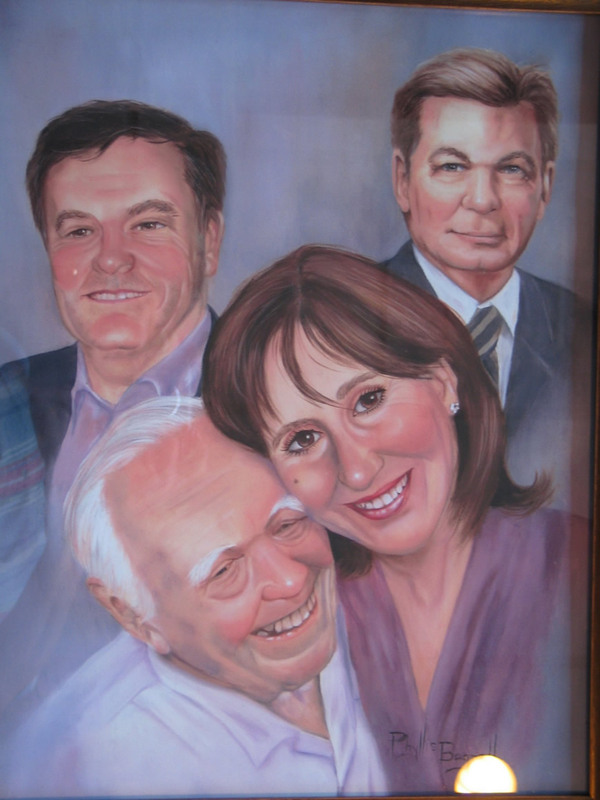 George Moore, Richard K Degenhardt,Fred Gary and Angela Moore imortalised in oil for eternity. 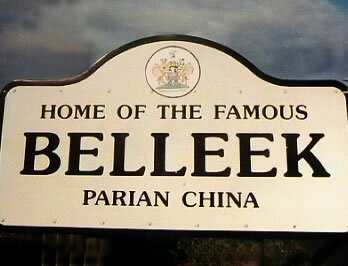 What a talented paintress we have within the society.